Whether you pledge to camp out or just promise yourself a stroll, these ideas will help you heed the call of the outdoors. As part of the National Wildlife Federation’s conservation efforts, the Great American Backyard Campout aims to get kids outside and to connect people with nature, both near and far. From stargazing on blankets and pillows on the deck to taking a nature walk at dusk, no act is too small or insignificant. It invites everyone to commit to spending one night — today, tomorrow or next year — outside and unplugged with family. Backyard camping is one way to get involved, but there are plenty of other ways to get outside too. “Keep it simple,” says Karoline Hurd, director of special events for GABC. Here are some ideas to get you started. Create your perfect campsite. Set the stage for an evening of camping — for one night only. Whether that means sleeping on an air mattress under the stars or pitching a tent on the balcony, make the night special. Watch what’s going on in your yard. While we may camp out in the backyard once a year, butterflies and bees, owls and bats, squirrels and foxes do it every night. Take a look at what’s joining you in the backyard. See this as an opportunity to slow down and really look at your yard and see how wildlife in your vicinity contributes to overall habitat health. Research projects and organizations that allow you to monitor and share the happenings in your own yard. Connect with neighbors. A single gesture can spark or rekindle a friendship. Invite neighbors over for s’mores or say hello during a walk through the neighborhood. Personal relationships build stronger neighborhoods. Have an impromptu party. Let’s not wait until summer is half over to christen the backyard. Call your friends, your roommates or your family and spend the weekend together outside. Keep things simple and casual. Set up two sawhorses, wood planks and some string lights for an outdoor dinner party. Order a pizza or have everyone bring something. Whether or not everyone sleeps outside, take a few hours to revel in the tastes and sounds of summer. Plan to not have a plan. Give your kids and yourself a big dose of unstructured playtime. Planned weekend activities keep everyone entertained and on schedule, but sometimes the most fun comes from the lack of an agenda. Unplug and try not to worry about what’s on TV for one evening. Show your kids around the yard. Have fun showing your kids what you do outside all day. Whether it’s harvesting tomatoes, raking fallen leaves, turning the compost or choosing wildflower seeds to sow, seeing the process gives kids a stake in the results. Who knows? You may find your new right hand. Cool off. Give the air conditioning a break for the afternoon and try to cool off in a more passive way. If your climate permits, take a run through the sprinklers, jump in the pool or put your feet in a fountain. You’ll beat the heat while opening yourself up to the weather outside. Build a bug box. Bees and bugs are resourceful when it comes to where they live, but we can also make things a little easier for them. Gather plant clippings and leftover wood from your yard to build a backyard bug habitat for local critters. This thoughtful craft project encourages everyone to ask questions about who we share our ecosystems with and how we all fit together in the big picture. Move living outside. Reimagine the patio as an outdoor living room. Turn the deck into the dining room for the evening. Instead of watching TV in the evening, play charades. If you like to eat around the coffee table in the den, sit around a low table for dinner outside. While you don’t necessarily want to duplicate indoor living outside, try to establish that same relaxed and comfortable feeling. Plan a great summer together. By August we’ll all be wondering where the time went. Focus on what your family would like to accomplish this summer and plan to make it happen. 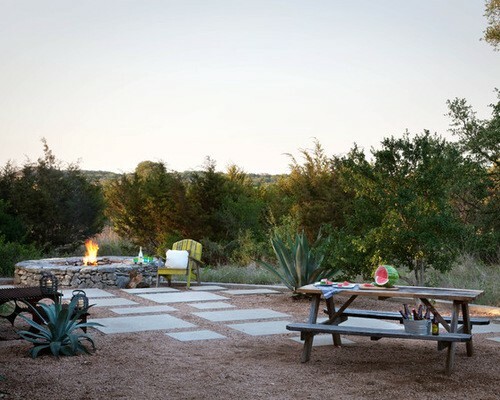 Build a bocce court, host an epic barbecue or finally get that music room set up.